Inquire for other Seattle dates | Location given to those enrolled. Enjoy a $55 discount for attending both workshops together. Why attend my Photoshop CC for Photographers workshops? Online workshops are just ‘watch and take notes’. That has proven to be the least effective way to learn anything technical. 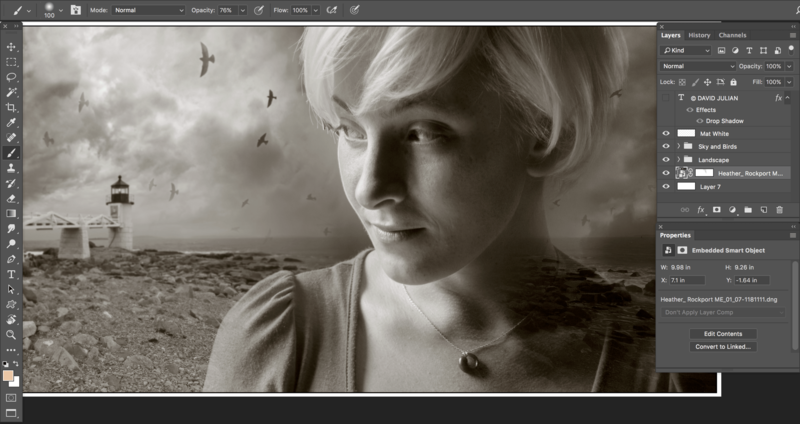 I teach Photoshop hands-on in a way you’ll effectively learn by doing. Using demonstrations, real-world samples and guided practice, you will be able to master your own digital workflows and turn your camera captures or scans into finished photographs and composites. Each student also receives a set of reference materials and tutorials to keep for additional review. You’ll leave with greater skill and confidence. I had not yet discovered. Very informative and well presented! I couldn’t wait to get home and start using what I learned. I look forward to his next presentation.” – Adrian B.
his ability to communicate it.” – Jen K.
• “David Julian is one of the most creative and inspiring presenters. I learn so much from him.” – Bernita M.
Easy setup for Photoshop’s workspace, color spaces and most important preferences. My workshop content is adjusted to class goals, and everyone receives individual guidance. Students leave with lessons, files and resource tutorial PDFs for use after the workshops, plus one month of free technical assistance! Blending two RAW captures for that perfect landscape or portrait exposure. Add textures to any image, and control precisely where textures appear. Students leave with lessons, files and resource tutorial PDFs for use after the workshops, plus one month of free technical assistance! Students wishing to go deeper into Photoshop can work with me individually. My workshops are limited to just twelve registered participants. Small group means more attention per person. Bring your working Mac or PC laptop, or desktop computer that you know how to use, loaded with at least Photoshop CS6 or CC. (if you don’t yet own Photoshop CC, it’s well worth $10/mo. You can download the free trial at Adobe.com ). I provide a USB Thumb Drive for transferring my files to your device. You may bring your own images too. $225 either day, or save $55 through February, by registering for both days at just $395. Space is limited. See drop-down menu below. Full registration below via Paypal or a Check is required to hold your seat and to attend. **Earn $25 off on your full weekend if you pay for a friend during your registration. Those preferring to enroll by check can email me for address. Checks must clear before enrollment is complete. Feel free to email me with any questions. Please read our workshop cancellation policy. Please send your address to me so I can send you a check. I tried Pay Pal, but it didn’t work.